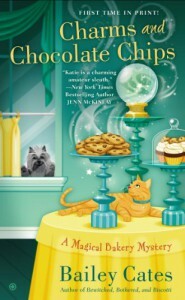 Charms and Chocolate Chips - Bailey Cates - What is Kimberly reading now? I think this bored me more than anything. I didn't find myself wanting to run home to it like I did the first two. I still like all the characters, but the story just wasn't that interesting to me. The killer was the same possessed crazy I've seen before. The Love Geometry I thought might be there wasn't there. Good! I don't think I could take that kind of math. I wonder if there might be a mathletes showdown in the future?